This secretive grassland sparrow is widespread and abundant in open habitats throughout North America. While 17 subspecies are recognized across this range, the geographic variation in appearance is subtle. Most populations are migratory, and the wintering range extends from the southern United States to northern South America, and the Caribbean. In Tennessee it can be found across the state where it is a fairly common to uncommon migrant and winter resident, and the Savannah Sparrow has become a recent breeding bird in the state. The first nesting record for this species was in 1973 in Hawkins County, followed by a nest found in 1987 Washington County. In 1991, 10 singing males were found in a few different locations in Johnson County. Since then, breeding-season Savannah Sparrows have been reported in Carter, Cocke, Greene, and Sullivan Counties. Often these breeding sites in the northeastern corner of Tennessee are shared with Grasshopper Sparrows, and occasionally with Vesper Sparrow. Description: This small songbird is cleanly streaked with brown and gray above, and white and brown below, with a short, notched tail, and a yellowish eyebrow stripe. Immature birds (June-August) are similar to adults, but are buffier. Voice: The song is an insect-like high, fine series of buzzes, each one lower-pitched than the preceding, with a low final buzz. The song is harsher and lower than Grasshopper Sparrow's song. Vesper Sparrow has a bold white eye-ring, and white outer tail feathers. Song Sparrow is larger, with a longer, round-tipped tail, and a thick mustache stripe. Both species can show a central chest-spot within their streaked chest. Grasshopper Sparrow has a flat head, shows buffier tones in the face and breast, has an un-notched spiky tail, and a complete eye-ring. Habitat: A variety of open grassy habitats, and fallow fields. Diet: Insects, and other small arthropods, also seeds, especially outside the breeding season. Nesting and reproduction: Savannah Sparrows are monogamous and will often raise two broods in a season. Clutch Size: Usually 3 to 5 eggs, with 4 most common. Incubation: Only the female incubates the eggs. Fledging: Both adults feed the young. The male continues to tend the fledglings while the female starts the second nest. Nest: The female alone builds the shallow cup-nest of woven grasses, placed on the ground, concealed by adjacent vegetation. 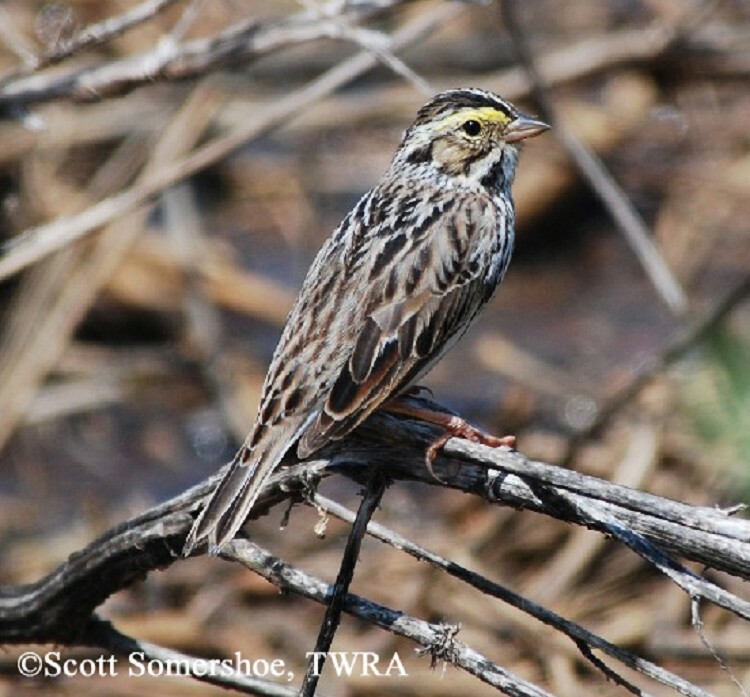 Status in Tennessee: The Savannah Sparrow is a regular, fairly common migrant across the state, and a relatively uncommon winter resident found especially in the southern half of the state. Migrants and winter residents arrive starting in mid-September and depart by early May. It is also a rare recent summer resident in the northeastern part of Tennessee. The oldest recorded Savannah Sparrow was 6 years 10 months old. It had been previously banded in May 1939 in Michigan, and recaptured in April 1945 near the same location, and released. The "Ipswich Savannah Sparrow," a subspecies that breeds in sand dunes on Sable Island, Nova Scotia, is nearly 50 percent heavier than most other Savannah Sparrow subspecies, and was formerly considered a separate species. Recent mtDNA analysis indicates that the Ipswich is in fact a subspecies, whereas the southwestern subspecies should be recognized as a distinct species, and may someday be known as the Large-billed Sparrow (Passerculus rostratus). Alexander Wilson (1766-1813) named the Savannah Sparrow for the town of Savannah, GA, where the type specimen was collected, and not the habitat in which it was found. Best place to see in Tennessee: Grassy habitats statewide during migration and the non-breeding seaon, and the northeastern counties during the breeding season, including Shady Valley. Wheelwright, N. H., and J. D. Rising. 1993. Savannah Sparrow (Passerculus sandwichensis). The Birds of North America, No. 45. (A. Poole and F. Gill, eds.). The Academy of Natural Sciences, Philadelphia, PA, and The American Ornithologists' Union, Washington, D.C.